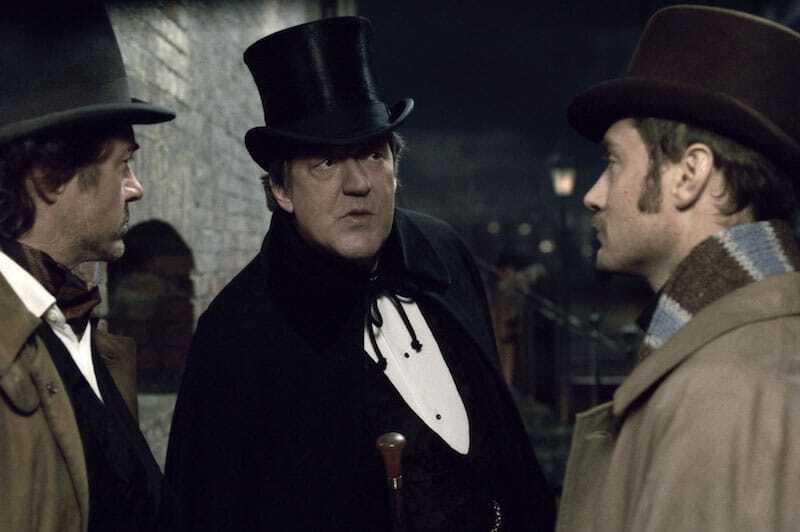 Sherlock (Robert Downey Jr.) and Mycroft Holmes (Stephen Fry) consult with Doctor Watson (Jude Law). With a bit of a waltzing, and what I hoped to be Holmesian, walk, I exited the theatre after seeing Sherlock Holmes: A Game of Shadows. I was, and still am, enthralled by Robert Downey Jr.’s portrayal of the quirky and ever brilliant detective. Jude Law is again excellent as Dr. Watson, the ever present, if slightly reluctant sidekick and Holmes’ better half. The movie brings viewers on a rollercoaster of emotions, from sadness to elation, all mixed with bouts of hysterical laughter. While Law and Downey Jr.’s portrayal’s were excellent, and of course alluring, I was most excited to see Stephen Fry make his way into the series as Sherlock Holmes’ brother, Mycroft Holmes. As ever, he was incredible. While the costume department obviously failed him in a particular scene (a lost costume, no doubt), Fry pushed on spectacularly to play the statelier, but ever as astute, Holmes. I particularly enjoyed Mycroft’s witty banter with Sherlock, as he first enters the storyline, emerging from what I assume was a rather bumpy carriage ride, what with that left wheel and all. Downey Jr. and Fry work brilliantly together, illuminating all the differences that make Sherlock and Mycroft brothers, and the similarities that make them family. I was also extremely impressed by the evil Professor James Moriarty, played skillfully by Jared Harris. As Moriarty, he was as cunning and silently evil, as Holmes is attentive and flexibly moral. Harris may well have been the scene-stealer in A Game of Shadows, but Steven Fry gave him a dead heat for his money. (As a side note for my Harry Potter fans, Jared is the son of the late Richard Harris, our beloved original Dumbledore.). Another extremely well crafted aspect of this movie was the use of several unique camera angles, slow motion and CG. The artists did an excellent job, and the camera work was exciting. As a movie buff, and partial film student, I was vey intrigued by the techniques and angles used by the camera operators. The entire crew did an excellently artistic job of shooting A Game of Shadows. I haven’t seen a few of the new releases yet, but this is definitely one of the movies to beat this season. It is an excellent sequel that does not try to outdo the original, but instead builds off it. I recommend you go out and see this movie straight away. Let’s tell a story together. I'd love to work with you to tell your story. Let's create something truly amazing!